It's a nice time to get away and come down and enjoy some time to relax in the fresh air of Fairview. Sanpete County is waiting. There is still plenty of snow on the mountain but the snow in the valley has melted and the golf courses will be open soon. Come get away for the weekend and you won't regret you did. Stay with us and you'll leave wanting to come back for more. No time to get away? You're always close to a get away when Sanpete County is so close by. Come down to Fairview and relax in our Cottage. No smog! No crazy traffic! No Inversion to deal with! Only an hour away from Provo or 90 minutes from Salt Lake City. Come enjoy the warm comforts of home in our vacation rental. The snow up on the mountain is deep, so come and stay with us. Play hard and rejuvenate here in your home away from the busy city life. What are you waiting for? Hello, the SNOW has finally arrived and you can get down here and do some snowmobiling, kiteboarding, snowboarding, skiing or whatever. There is 5 feet at the corrals and more than that at the parking lot up by the Drift before you head over to the Huntington side of the mountain. What are you waiting for? Get down here to Sanpete County and enjoy some sunny weather in Fairview (incidentally we never get the inversion down here), and its amazing what a little sun and fun can do for an otherwise gloomy Salt Lake and Utah Valley forecast. Stay in the Cottage and relax or aggressively participate in your favorite winter sport. New day, but no new snow yet. Let the white stuff come as soon as possible and as much as possible. We like to play but we also like to keep Fairview as green as possible in the summer and we need the white stuff to do that. Still a good time to come visit. We just added a flat screen TV to the master bedroom so you can stay in bed and relax while you watch your favorite shows. Come down the weather is great. You can probably still golf at Palisade or in Nephi if this weather holds out. Thanksgiving is gone and so is our diet, but the food was sure good. Fairview was beautiful as ever and the weather couldn't have been any better. It is a guarantee not to last too long, which is ok because we need the snow and so do the snowmobiles. Snow on top is down to a solid 18 inches and we still see kiteboarders and a few brave snowmobilers out there. If you're looking for a quick get-away then we can help you out. So get away from the crowds up north and come relax down south with us. The bow hunt for late season elk is still on and quite a few people have depredation elk tags too. Come stay in the warmth of our cottage. Recently a good friend of mine and his wife had a limited entry elk tag on the Manti unit in Sanpete County. Even though she was pregnant she shot this nice 335 B&C Bull Elk. She did some good shooting while her husband Dave and Father-in-law did all the heavy lifting. Pictured is Dave with his wifes nice Sanpete County Fairview Canyon Bull. Just another thing to do here in Sanpete IF you can draw the tag. Welcome to our blog. It was another beautiful day in Central Utah. Yesterday We went up on Fairview Canyon and there was about 2 feet of snow by the Drift parking lot. A few brave Souls were out on their snowmobiles and several Kiteboarders were enjoying the wind and snow from the parking lot. I personally need just a little more snow to take our machines out, but if you're careful I guess you could go. Kiteboarding doesn't need quite as much snow to go. A few have hit Walkers run too if you like to go snowboarding. A few more good storms and it will be full go for all the winter activities. 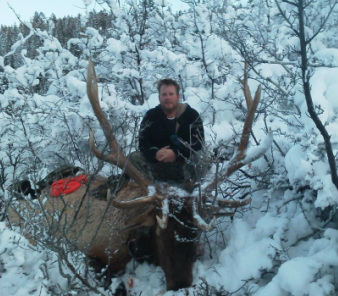 A few hunts still exist like the late season archery elk hunts and some cow elk hunts. Quite a few like to chase bobcats and mountain lions too, so I guess there are a few more hunts to go this winter. Coyotes also have a bounty on them so you could do that too here in Sanpete County. If you like the outdoors there is always something to do around here if you're willing to get outdoors and off your couch. Fairview Vacation Cottage is in Fairview Utah and is a rental for single or multiple night get-aways or vacations. Sanpete County is the gateway to snowmobiling, hunting, hiking, horseback rides, atv's, fishing, sightseeing, Mormon Miracle Pageant, biking or anything else you can dream about doing. Relax, reinvigorate and recapture your energy while you stay with us.